As I ventured this morning into the Second Ave. Subway launch box beneath the area from 92nd to 95th Sts. along the Upper East Side, I was struck by how utterly massive the underground cavern is. It spans more than three city blocks and bottoms out at a depth approximately 60-70 feet below street level. Apartment buildings loom over the hole in the ground, and the scope of this project — an undertaking of massive proportions — is staggering. For the first time since the April 2007 groundbreaking, the MTA invited reporters and city officials underground to mark another Second Ave. Subway milestone. Today, at shortly after 10:30 a.m., MTA CEO and Chairman Jay Walder blasted an air horn that marked the start of the tunnel boring machine’s journey from 92nd St. to 63rd St. With two City Council members and a House representative along for the photo op, the MTA reaffirmed its commitment to Phase 1 of the Second Ave. Subway and stressed the December 2016 completion date. A close-up of a cutterhead blade. 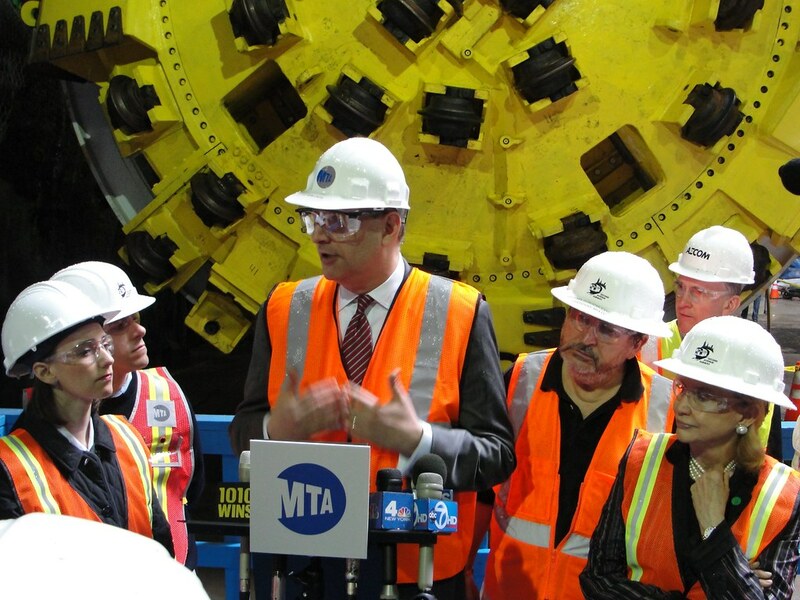 Prior to the ceremonial launch of the tunnel boring machine, Michael Horodniceanu, president of MTA Capital Construction, took reporters and photographers on a tour of the launch box. He spoke at length about the progress they plan to make now that the 500-foot-long, 450-ton TBM is ready to go. The machine is going to dig out approximately 40-60 feet of dirt a day and will be operating nearly non-stop until next November. The first tunnel — the downtown tube on the west side of the street — will reach the existing tracks at 63rd St. by January 2011, and the MTA will then pull the TBM back through the tunnel to start working on the uptown tube. When all is said and done, the TBM will have dug out two tunnels 7800 feet long. 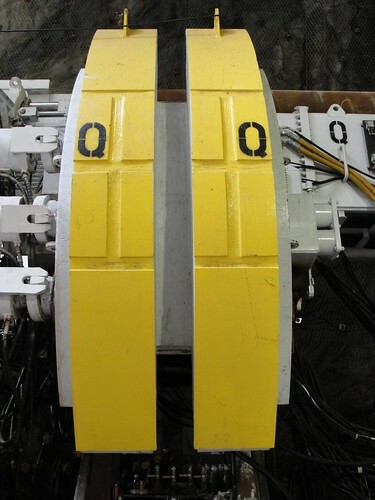 Currently, the TBM is decked out in the familiar yellow of the BMT Broadway trains with Q markings throughout the surface. The Q, running north from 57th St. and Broadway to 96th St. and 2nd Ave., will be the original Second Ave. Subway, followed eventually by the T train when and if Phases 3 and 4 reach south of 63rd. This is the view from approximately halfway up the staircase that feeds to the street level, and it shows just how massive this project is. The machinery on the left is a part of the TBM tail, and the conveyor belt will bring debris and rock out from the two tunnels. The concrete and support beams are bracing the tunnel walls. In this picture, the concrete supports are visible, and two Second Ave. buildings loom over the open hole in the ground. These buildings, some 120 years old, are literally atop the subway tunnel, but MTA officials say residents won’t know when the TBM is passing underneath. Interestingly, the utilities are still exposed for all to see. The Second Ave. water main is wrapped in insulation, and the MTA will eventually bury all of the pipes as they begin to fill in the tunnels and construct the station caverns. Despite this concrete beginning, there’s a reason why this project still has at least 6.5 years to go. Before the launch, I couldn’t resist posing in front of the TBM, and after, Carolyn Maloney spoke about the money and the timing. “It’s our job to keep it on target” for 2016, she said. With $1.3 billion in federal funds behind it as well, the pressure from DC is squarely on the MTA. “If they decided not to build,” she said, “we lose the money.” And so the TBM will start its journey inching slowly south as a subway line eight years in the making moves another step closer to reality. Below is a slideshow of all of the photos I took underground. As the lighting conditions varied, some shots are better than others, and after the jump, check out a 45-second video of the TBM cutterhead spinning as Jay Walder celebrates the moment with an air horn. Here’s a question: Let’s suppose that the MTA is serious about eventually building all four phases of the SAS. I know there are many doubts about that, but for now, let’s suppose it is the case. Inserting the TBM, and then removing it at the end of a phase, costs money. So how much is lost by extracting the TBM ad the end of Phase I, and then re-inserting it to begin Phase III, as opposed to just keeping it in place for the tunnels that will eventually go down to Lower Manhattan? I know, I know, it’s hypothetical, as there are no plans to go south of 63rd Street anytime soon. I’m just curious. I was wondering the same thing and didn’t have time to ask. I think it’s also a matter of timing though. The TBM is supposed to be finished with its work five years before SAS Phase 1 opens. In an ideal world, it would continue north or south or both so that the tunnels are in place for the future phases, but I don’t think they can keep it idle underground for a half a decade. Maybe they can keep it down there forever… lazily digging tunnels for transit lines yet envisioned. Just set thing on go and take it from there! Unfortunately, due to the wildly differing geology between various portions of Manhattan, they can’t use this TBM to dig all of it. 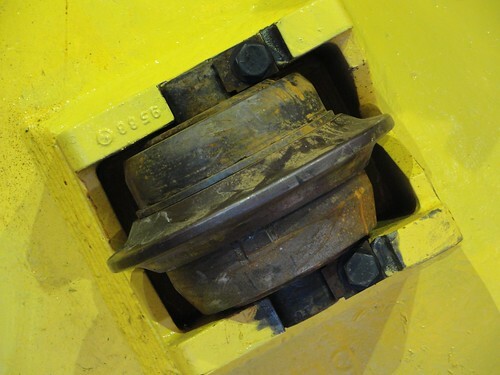 Significant portions of lower Manhattan will have to either be old fashioned cut and cover or use a more sophisticated Double Shield TBM or even an Earth Pressure Balance TBM. The TBM being used now is perfect for Manhattan Schist, but it would risk tunnel collapse if you tried to use it in softer earth, like that of Manhattan below mid-town. Now, what would be smart would be to have the engineering design for the new tunnel portion for Phase II complete, which could be done with this TBM. Have that engineering work and put it out to bid before this TBM is done. The existing contractor, already being mobilized would have a significant advantage, so the same TBM could just be turned around and sent uptown. Now, while I think Phases 3 and 4 are important in the long term, I actually think a better move would to be to extend phase 2 down 125th St. all the way over to the Broadway Line on the West Side. An uptown crosstown line would add a huge amount of flexibility to the system and alleviate a huge amount of the traffic on 125th St. It could also spur significant development of the South Bronx, making it easier to get to any part of Manhattan with fewer transfers and little back tracking. What is the southernmost section that can be built with the current TBM? Even if it’s 34th, it might make sense to send the TBM down there before backing it up to dig Phase 2. A T train that just goes to 34th may or may not be useful – the frequency splitting might cause reduced ridership, but if might not, instead relieving the Lex. On a similar note, could the current TBM work in Harlem? 125th is a valley with a high water table; I don’t think it has schist close to the surface. A 125th crosstown is definitely necessary and clearly possible, but could it be done with the SAS TBM? Phase III can entirely be done with the existing TBM. 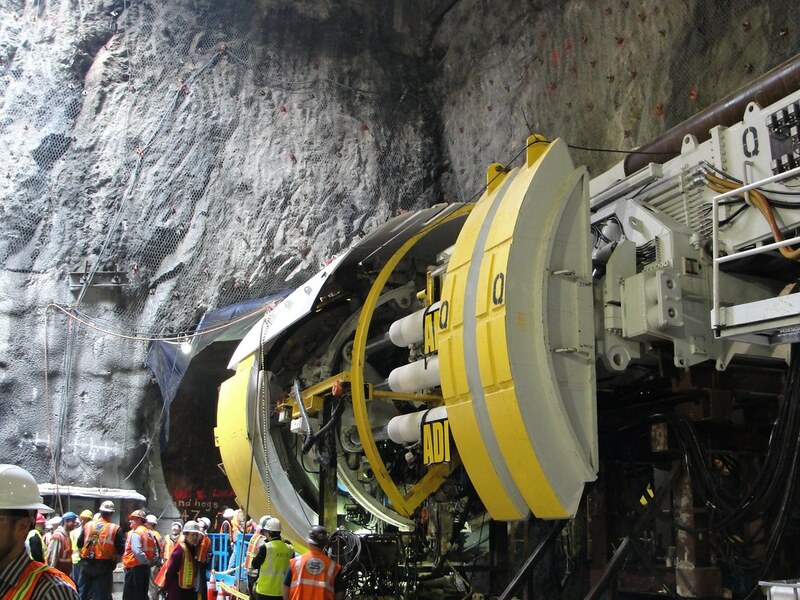 According to MTA documents, however, Phase IV requires a soft-soil TBM, and they have yet to finalize engineering for the phase for a long time to come. the following PDF from the MTA website shows the full length SAS and the tunnel construction methods etc. A gold mine of info! Thanks much for this link. Among other things, the site makes clear why Phase II will not be cheap, despite the earlier work: All the easy parts have been excavated, it’s just the three stations that will need to be constructed. Ha. If the missed-opportunity station on 42nd St at 10th Ave was gonna cost nearly half a billion, not including the tunnel being dug by the #7 line’s own TBM, then Phase II pencils out at $1.5 Billion for stations, plus the cost of tunneling through those unbuilt stations. Hmmn, we’re looking at $2.5 Billion? $3 Billion? or more? I still hope to live to see Phase II underway, if not completed. But by the time Phase III gets going, I’ll be the oldest living man in the Guinness Book of Records. Well, the one good thing about Phase II is that the current state of it means that it could be chopped into bite-sized 500 million dollar pieces — one station at a time. The tunnelling through the unbuilt station really doesn’t add any cost because it’s cut-and-cover. The curves for 125th St. haven’t been built, though, so that adds cost — and 125th St. will require some impressive underpinning work (being underneath the Lexington Line and the Metro-North station) so that one may be much more expensive. Thanks for finally addressing what kind of TBM is being used; I guessed that it wasn’t a shielded hard rock TBM from the pictures. It has me wondering now why they didn’t save themselves the extra labour of having to do concrete pours in the tunnels afterward by getting that double shielded hard rock TBM to line the walls as it went in order to provide full operational flexibility. Granted, they’re already pipelining the process of prepping the tunnels by boring out the west one then lining that one as the east tunnel is bored, but I really do wonder how much that extra labour costs and how much a double shielded TBM would’ve cost to set up and operate. …Probably should’ve just pulled one of the TBMs from the Channel Tunnel project to build double-wide tunnels and had it go all the way down to Staten Island. From what I remember, those things did upward of 100m a day – this one’s going to barely manage 17m a day and the tunnels won’t even be lined…I guess something’s better than nothing at this point. I’m all for a tunnel to Staten Island, but SAS is the wrong place to hook it up to. Ideally, the line to SI should have a lot of transfers to other subway lines, to allow SIers to go to Downtown Brooklyn and to many destinations within Manhattan. SAS is too far east for this. I’d much rather that SI were connected to Grand Central through an RER-style tunnel, stopping at Union Square and Fulton Street. It could continue further north on Metro-North, with minimal changes to the rolling stock. When the city’s population growth gets to the point where a Manhattan-Staten Island tunnel makes sense to build, I think connecting the tunnels to the E train at WTC would be the best move. Since it’s an IND line and the SIR uses modified IND rolling stock it would require relatively little modification to the existing SIR infrastructure and connect Staten Island commuters directly to the WTC transit hub and all the other major E line connections (Penn Station, Times Sq). One obvious engineering issue would be boring a new tunnel into the WTC site (in fact, it would make the most sense to make provisions for this expansion now, considering that the WTC site has yet to be built out). 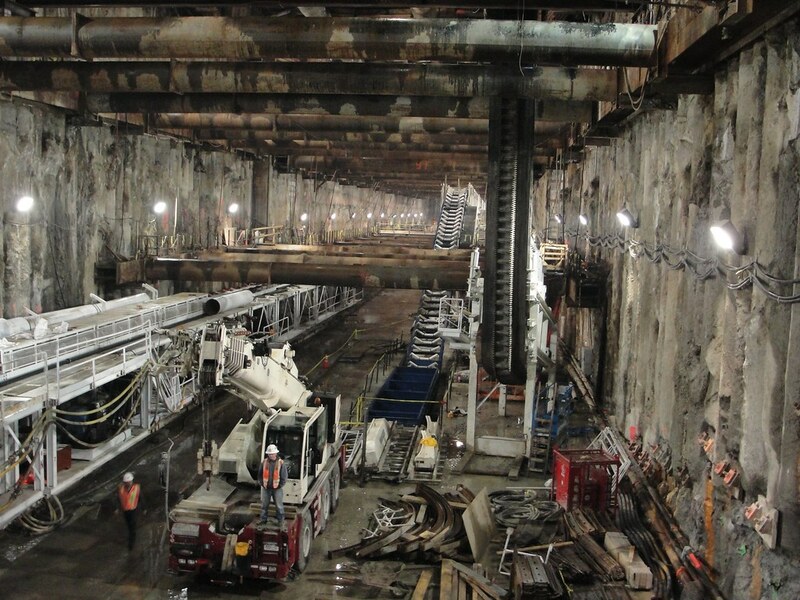 Creating an RER-style tunnel to connect the new tunnel to Lower Manhattan, Union Square and Grand Central is interesting but we have seen first-hand with the SAS launch box that tunneling under so much existing Manhattan infrastructure is expensive and time-consuming. With an E train continuing on from its WTC terminus through a harbor tunnel to St. George, the vast majority of the tunneling would be below the harbor. I think this tunnel will get built eventually. While the ferry certainly has its charm, it is an archaic, relatively inefficient means of mass transit – a tunnel would cut the 30 minute, 5-mile journey to approx 5 minutes (assuming that these new tunnels will be engineered to allow the rolling stock to operate at max speed (60 mph). I hope I live long enough to see it built! The Lower Manhattan part is the most difficult. Forget the rent-seeking and the exorbitant costs you’re seeing for SAS; those are a problem of politics, not of geology or infrastructure. But once you get to Lower Manhattan, where new construction has to go under multiple subway junctions, cost will go up no matter what. The basic reason for doing it RER-style is that it provides a faster route into Midtown, which is important if you live on SI. The SIR used to be a mainline and was built to the standard US loading gauge, so turning it to commuter rail is just a matter of shaving back the platforms. The only operational advantage of hooking up to the subway is that if the FRA refuses to allow lightweight trains on mainline tracks, it’ll be prohibitively expensive to maintain the line to heavyweight train standards. Forgive me if this has already been addressed, but… five years?! That seems excessive to me. Correct, lots of fitting-out to be done after the tunnels are drilled. Tunnel liner, ventilation plant, tunnel lighting; track, third-rail power, signals; stations, entrances, elevators, etc. Station construction is complicated, and contains a lot of things which have to be done one-after-the-other, not simultaneously. Station construction will probably actually be the single thing controlling the opening date. Wow, I’d have kileld to be able to go down in there after spending so much time seeing the site develop. Is that as fast as the cutting head spins? is it not like a drill bit, shouldn’t it go a little faster? Or were they just trying to be safe since people are standing in front of it? Also, how will they manage phase two? Are htey going to back the machine up, turn it around (somehow?) and head north on 2nd? I know two sections exist north of 96th, but I also remember somewhere reading a map that showed which sections of the tunnel will be constructed via which methods, and I’m pretty surethe TBM is headed up that way. Am I wrong? by that time, you’re digging out phase II, which mean Phase I should almost be in revenue service, so to get to phase 3 you’d have to shut the line down for a weekend, it seems. No, that’s actually how fast they usually spin. They’re not actually drills. They’re grinding the diamond cutter heads against the rock face, with several hundred tons of hydraulic pressure. The heat buildup from cutting fast would kill the cutting discs. Most rock drills run slower than metal or wood drills. Drilling through rock is more about exerting pressure to get the minerals in the rock face to fracture, unlike wood, where you’re trying to slice through the cellulose cells and get them out of the way before they clog the drill tip. The harder the material, the slower the drilling. Manhattan Schist is REALLY hard. That’s why we were able to build the earliest skyscrapers: the super hard bedrock, near to the surface made it easy to support the load of the tall buildings. Phase II will be probably be launched from north of the existing launch box, probably one of the existing tunnel sections. It will be connected to the Phase I storage track tail section, north of the 96th Street station, which would only minimally affect the revenue operations of phase 1. The launch of a TBM for phase 3 would probably be done from a little south of 63rd street, with the connection being dug out manually to be sure as to not damage the existing structures. So, they’d have to dig out a whole new launch box and assemble a TBM inside that one. Since the 2nd Ave. tunnels already exist for Phase II, all they have to do is construct the tunnel from ~120th St. to 125th St. and Lexington Ave. I think they are planning on mining that with cut and cover (for the station). I’m not so sure that the Phase 2 tunnels that were built in the 1970’s extend UNINTERRUPTED from 96 St. to 120 St. I believe that there are unbuilt gaps. They don’t. They were built from E. 99th to E. 105th Streets and from E. 110th to E. 120th Streets. If memory serves, the space in between was supposed to be an E. 106th Street station. It just occurred to me now that the future location of a station must be included in the tunnel that is being mined. After all, the 72nd St. and 86th St. stations will be located along the tunnels that are now being bored by the TBM. They will have to go back and finish mining any parts of the Phase 2 tunnel that were not done in the 1970’s. I’ve looked it up now. According to the 1971 MTA Annual Report, the station was to be called Franklin Plaza. It was to be located between E. 106th and E. 109th Streets. There were also to be stations immediately south of the E. 99th Street-E. 105th Street section (96th Street East, E. 95th Street-E. 97th Streets) and immediately north of the E. 105th Street-E. 120th Street section (Triborough Plaza, E. 121st-E. 124th Streets), with the tunnel ending at E. 126th Street. They just had the report on FOX5. Dam, that machine is huge! 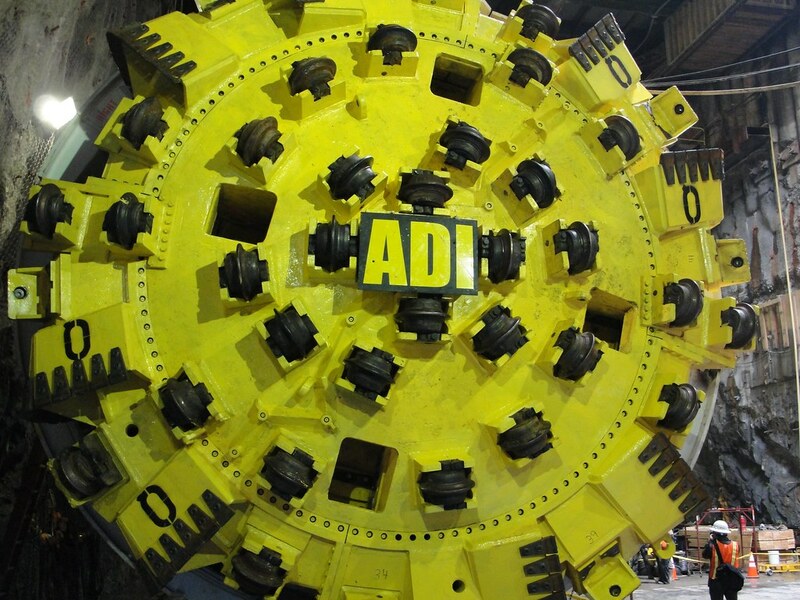 On WINS radio, they made it sound like the TBM will be turned around after the first tunnel is complete, and then it will produce the parallel tunnel by boring its way back northward. The TBM will bore the west tunnel first, then be backed up to the launch box and get re-launch south on the east bore. While the east tunnel is being mined, the contractor will pour the concrete lining in the west tunnel. Once the east drive is done, the machine will be backed up again and disassembled and trucked out from 91/92 Street. I guess they’ve signed a legally binding contract with the tunneling company. Not sure that’s the case for later contracts required to put anything in the tunnels, such as tracks, signals, lighting, fan plants, stations, water pumps, etc. Even though the annual cost of making this improvement is small compared with the enormity of NY’s fiscal problems, I wouldn’t bet on it. In the latter case, they’ve basically signed a legally binding contract with the federal government. As Maloney said, if Phase 1 doesn’t open or if the MTA stops work, it has to return nearly $1.5 billion to the federal government. Well, let’s hope so. But anything is possible in Albany. This one is above Albany’s pay grade (praise jeebus), and the Feds I’m pretty sure don’t F aroudn with dollars, this thing will guaranteed open to the public at least to 96th st, and 90% sure it’ll be at 125th be 2025 (yeah, I know). If station mining is finished, station fitting-out will be finished; the return on investment from finishing at *that* point would be so great no mayor could resist it. Ben, Thanks for an excellent report. Your good work here is much appreciated.